Easy Thanksgiving crafts that you can do with the kids – without too much trouble or crazy supplies – might be just what you’re looking for this time of year! 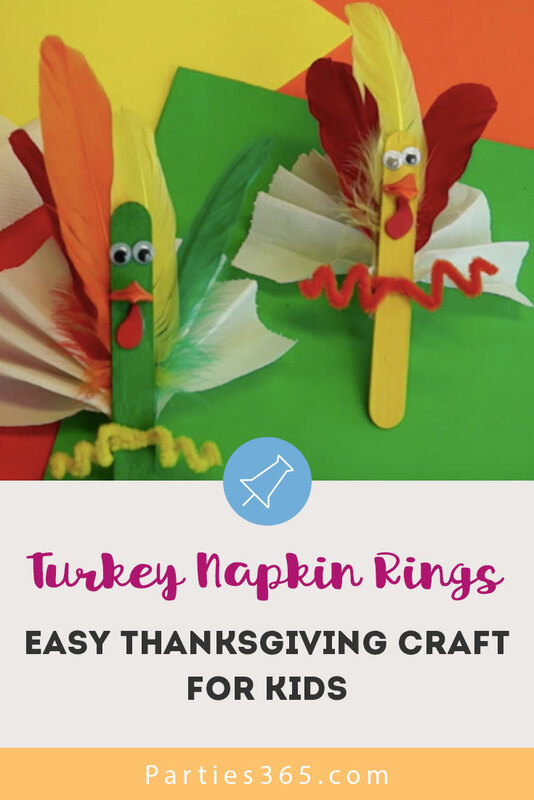 We have a cute Thanksgiving Turkey Napkin Ring activity that totally fits the bill! These DIY homemade napkin rings are something your kids will have fun with while they help you set a festive and fun holiday table. Elmer’s Glue put together an easy to follow instructional video for these napkin rings (and we’ve got it at the end of this post for you) but we wanted to walk you through the instructions for the project step by step. Step 1: Place glue for the feathers on the back of your craft stick. Step 2: Glue on your choice of colored feathers. You can probably fit about 3-5 feathers. Step 3: Draw a small diamond on your orange foam paper for your turkey’s beak. Step 4: Cut out your beak. Step 5: Draw your turkey’s wattle onto the red foam paper then cut it out. Step 6: Place a small dab of glue onto the middle of the diamond turkey beak. Step 7: Fold the diamond in half to create your beak and clip it closed with your clothespin while the glue dries. You can gently curl back the ends of the foam paper too to make the beak look open. Step 8: Place some glue on top of the feathers as shown and attach a pipe cleaner/chenille to the back of your turkey. Step 9: Flip your turkey over and glue on your turkey’s eyes, beak and wattle. Step 10: Get your napkin and fold it like an accordion. Step 11: Fold your napkin in half. Step 12: Wrap your pipe cleaner around your napkin with the folded part towards the base of the turkey (e.g., folds should open toward the top). Step 13: Loop the ends of your pipe cleaners around a pencil to twirl or tie them in a bow to finish the look. Enjoy this fun and easy Thanksgiving craft with your kids!